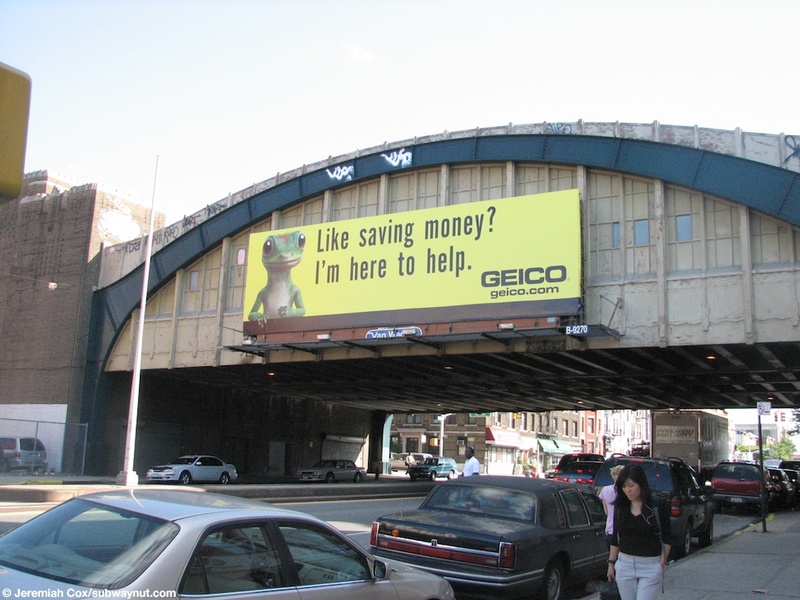 The 4th Avenue Station is located on the Culver Line's Viaduct over the Gowanus Canal. The station is technically a local stop with two side platforms for the four tracked line. 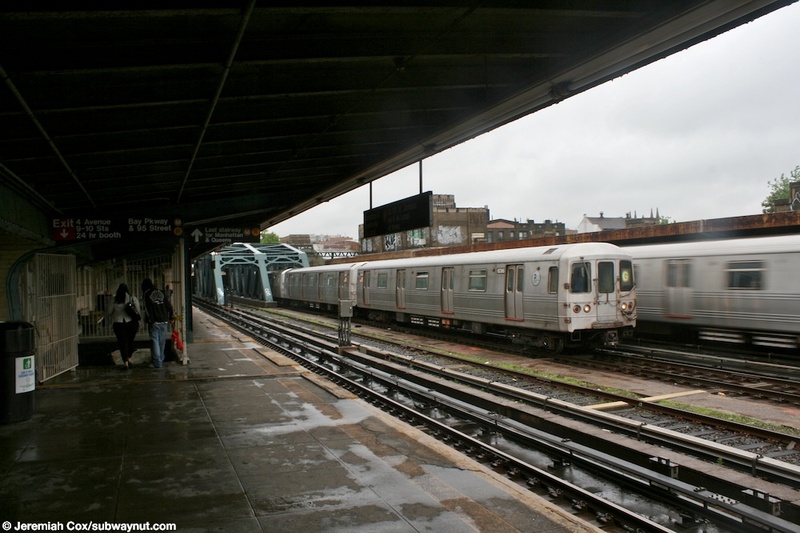 G trains, before this viaducts construction started, forcing them to be extended to Church Avenue (beginning July 5, 2009), relayed on the express tracks within the 4th Avenue Station after terminating at Smith-9th Streets. The station platforms have definitely scene better days and the station will be fully rebuilt quite soon. 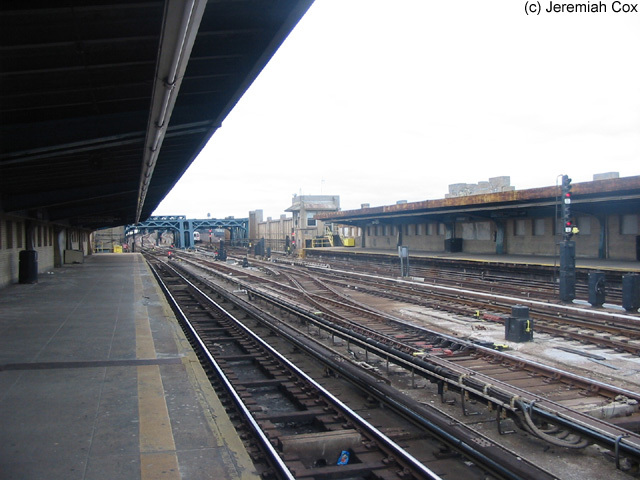 The platforms have what looked like tan-colored brick walls, forming windsreens and quite wide platforms with canopies that are cantilevered out so there no columns on the platforms. A small portion of the western end of the station is exposed an uncovered. Just east of the station the four express tracks go back underground, not going down all that much but simple into the slope that is Park Slope. 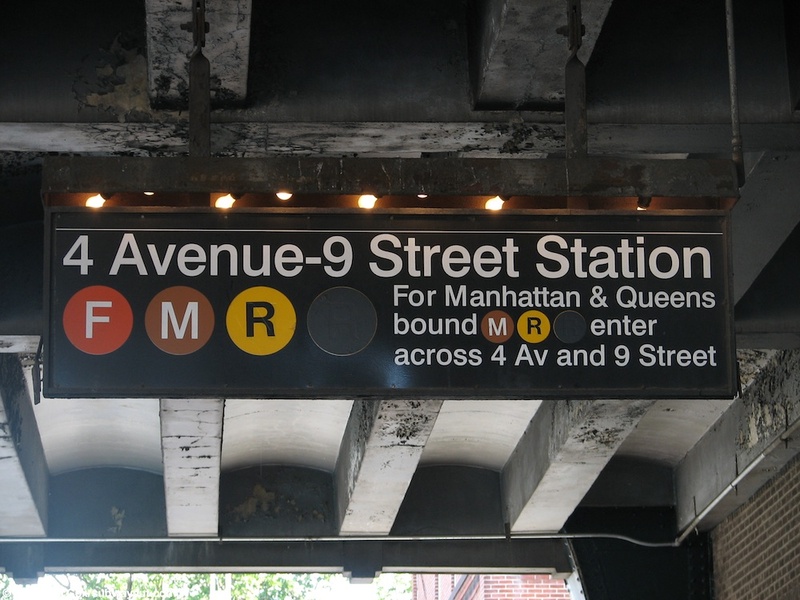 The stations exit is at street level, directly under the viaduct on the west side of 4th Avenue, towards the eastern end of the platforms. Two staircases lead down from each platform to an intermediate upper mezzanine passageway (where there's tiling for closed Men's and Women's rooms) before their more staircases down to ground level and the main turnstile area. Doors lead out to 4th Avenue and also along 10th Street. 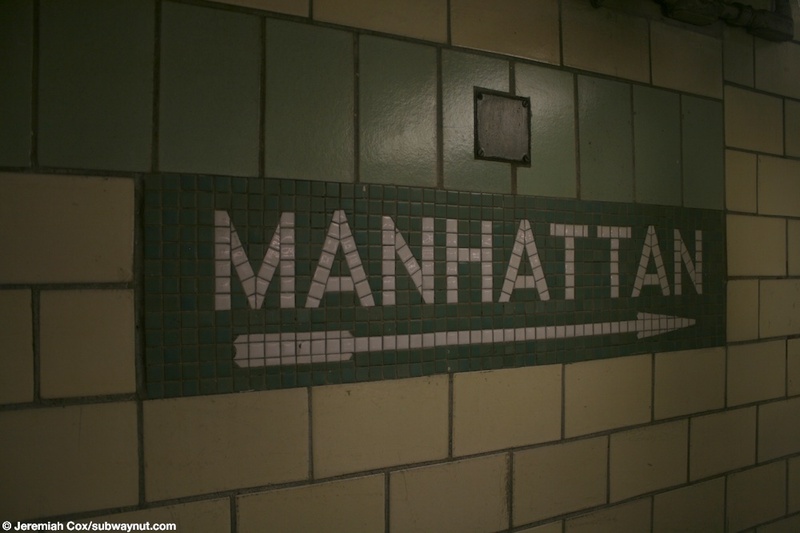 Each of these entrances is marked by an original 1930s IND SUBWAY sign. 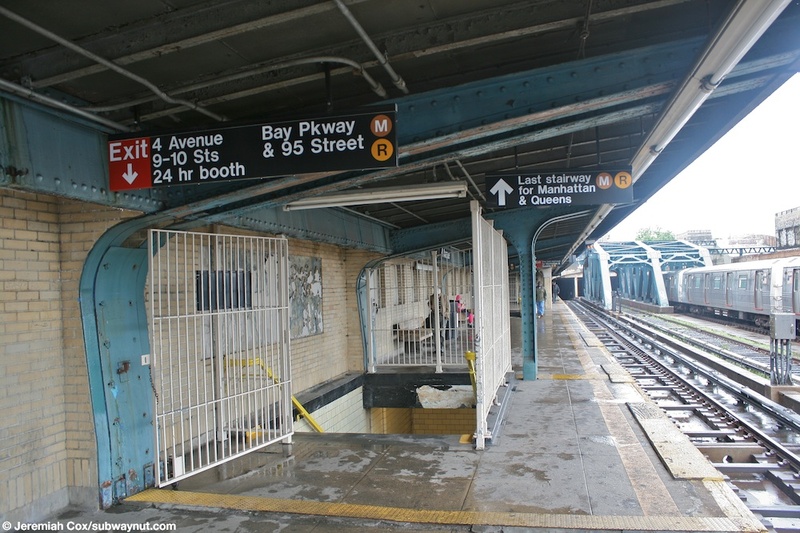 There is another staircase that leads down from this fare control area to the Bensonhurst/Bay Ridge-bound BMT 4th Avenue subway platform. 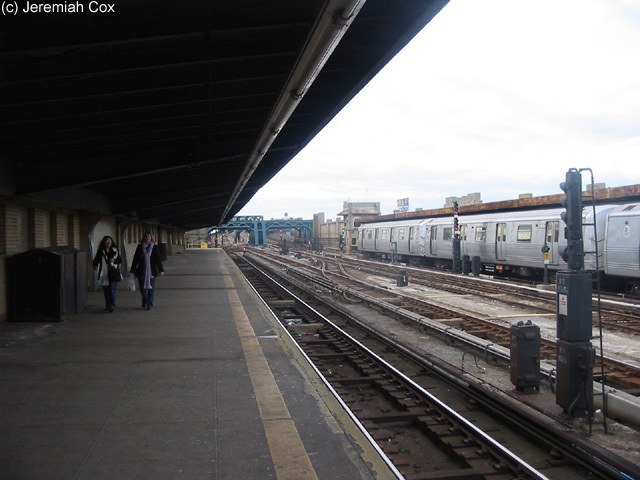 The transfer to the Manhattan-bound BMT 4th Avenue Subway platform is from single staircases at the extreme eastern (southern) ends of each elevated platform. These staircases come together and pass by an abandoned secondary exit when its at street level. 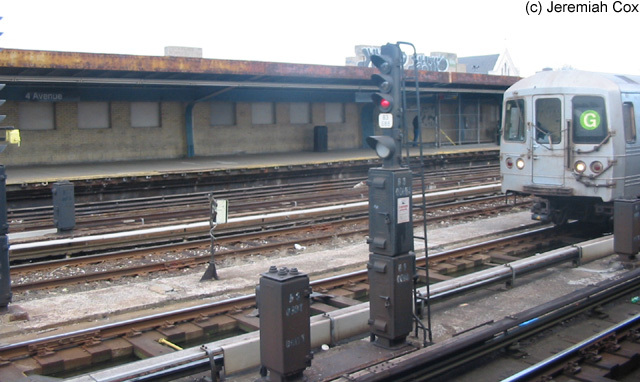 This is marked by an area that closed off by metal sheething within the station, and a locked gate along the east side of 4th Avenue, with would should be a Subway sign built into the brickwork above the locked gate that has been perminately turned off. 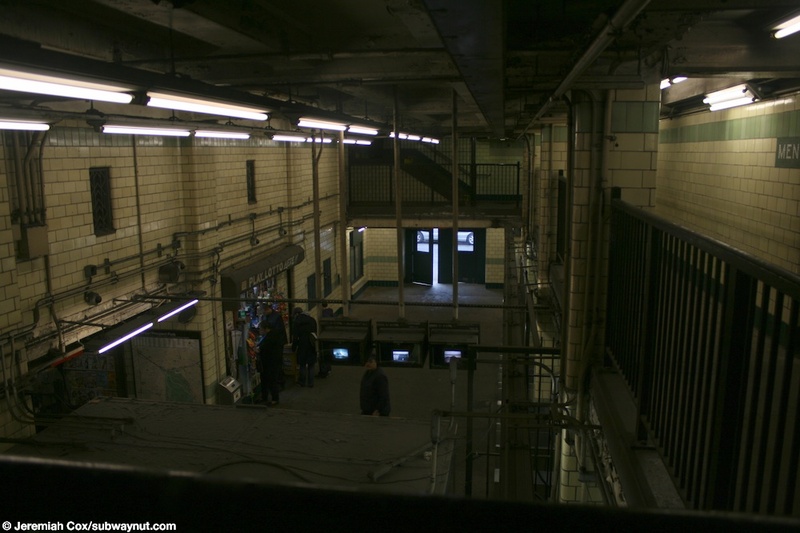 These staircases lead to a single staircase down to the extreme southern end of the Manhattan-bound 4th Avenue Subway Platform. The staircases and passageways of the station all have cream tiled walls with accents of green. 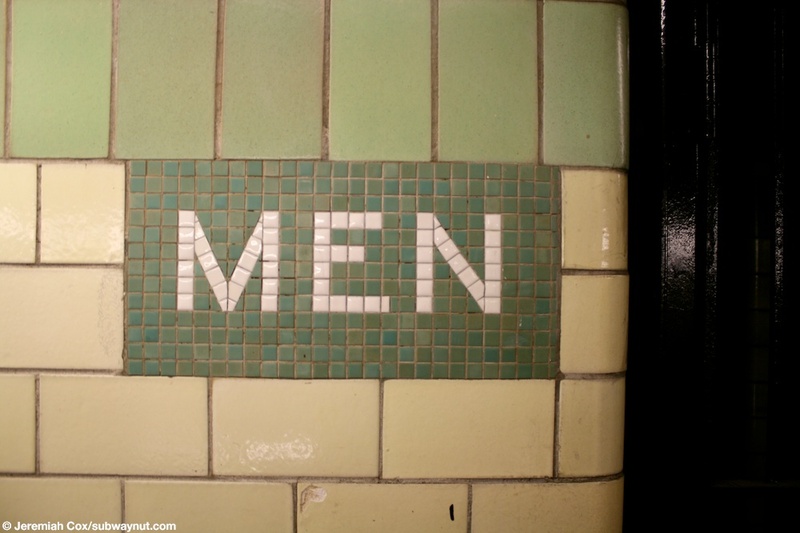 There are mosaic directional signs that say To Street, Coney Island, Manhattan, and B.M.T Subway. 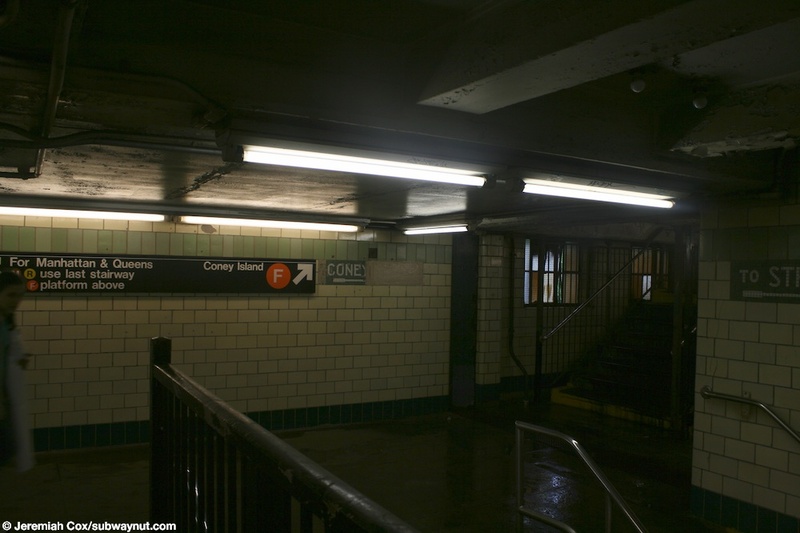 (4f1) Looking down the CI-bound platform at 4th Avenue. 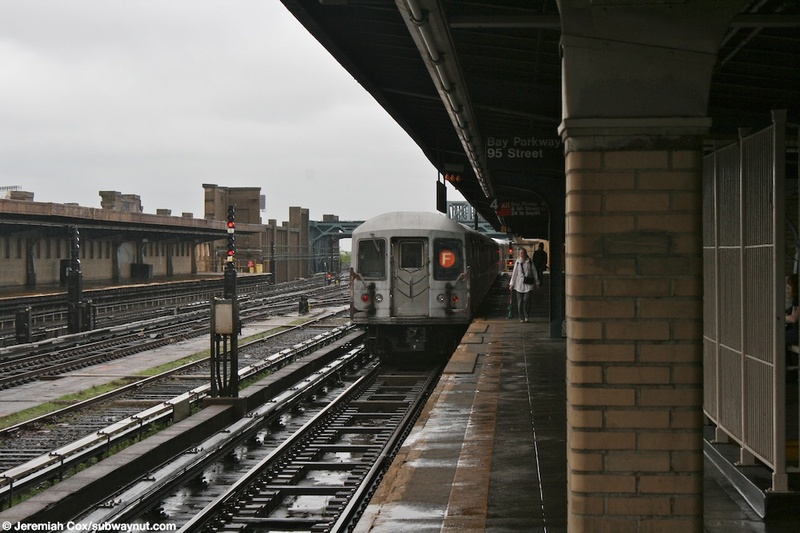 30 December, 2003 (4f2) Looking across to the Manhattan-bound platform at 9th Street, with a R46 G train relaying on the express tracks. 30 December, 2003 (4f3) Looking down the empty and wide CI-bound side platform adn across the other four empty tracks at 9th Street. 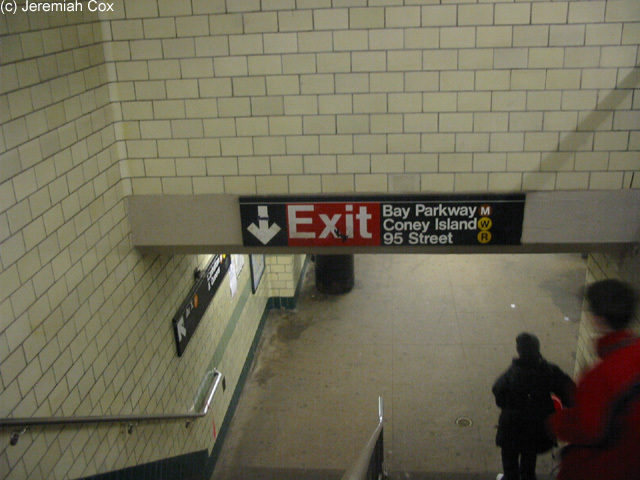 30 December, 2003 (4f4) A staircase down towards the fare control area at ground level and the transfer for the Bay Parkway M, Coney Island W (its out of oarder because the W sticker has been put over an N), and 95 Steet R at 4th Avenue-9 Street. (4f5) Looking down 4th Avenue towards the subway vaiduct's bridge across it. 6 June, 2007 (4f6) A 4 Avenue-9 Street Station sign beneath the viaduct, its hanging on a very old structure with incandescent light bulbs trying to help illuminate it. 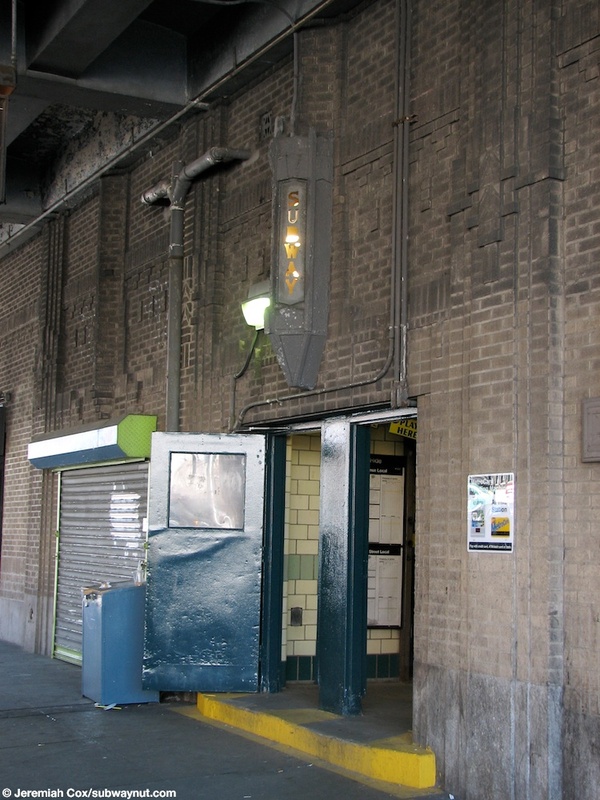 6 June, 2007 (4f7) A street level entrance to the station house at 4 Avenue-9 Street, with two doors into the crowded station area, and an old 1930s still illuminated Subway sign above the entrance. 5 June, 2009 (4f10) A R42 F train begins to leave 4 Avenue. 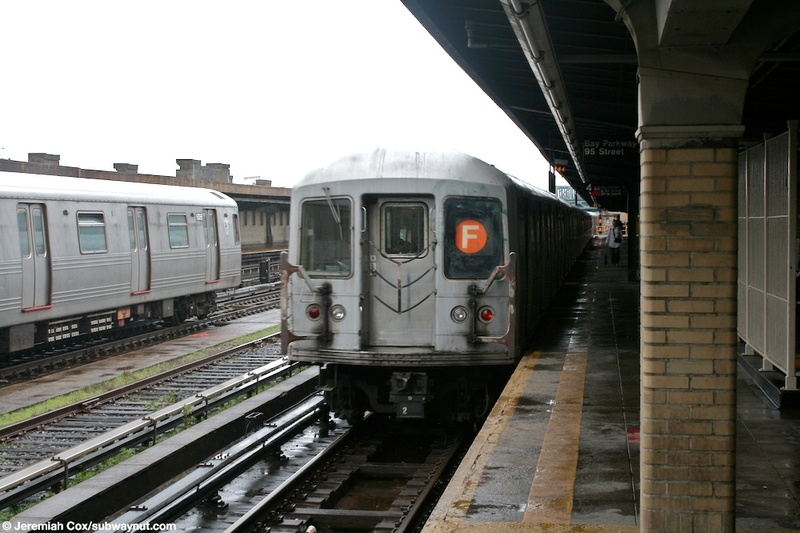 5 June, 2009 (4f11) A Manhattan-bound R42 F train continues to leave 4 Avenue. 5 June, 2009 (4f12) The view down from above of the main and busy fare control area located at street level at 4 Av-9 Street. There is a newsstand, and the CCTV monitors that face the token booth are also visilbe in the foregrounds. 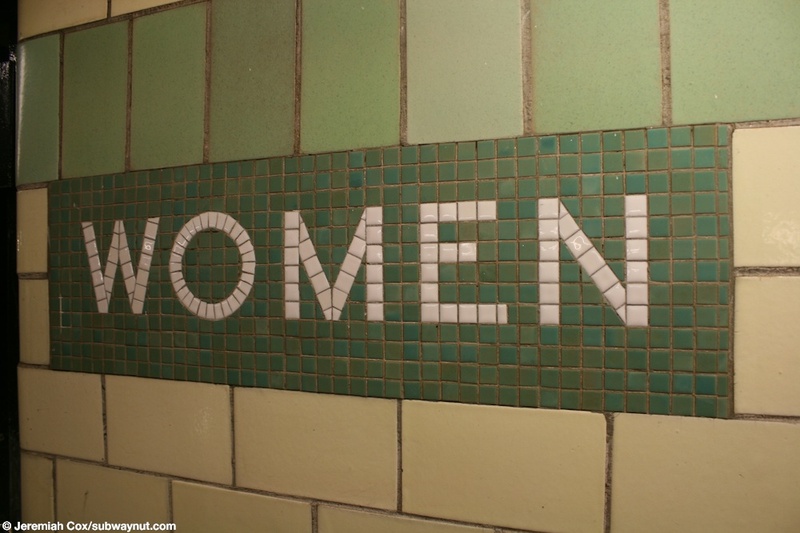 5 June, 2009 (4f14) A mosaic sign next to the closed Men's room at 4 Avenue. 5 June, 2009 (4f16) A sign for the Coney Island-bound F platform at 4 Avenue, on an upper mezzanine level just above the main fare control area at street level.